If you’ve been following me on Instagram, you’ll know that I declared October the month of self-care. Not in a hedonistic, self-pleasure seeking way, but rather one deriving from a sudden realisation, or a reminder rather, that self-love is where it all begins. I love to travel, inspire, and be a good friend but you can’t pour from an empty cup. As mine began dangerously nearing the bottom, I decided to fill it with love, care and kindness. I took up yoga and meditation. Filled up my bedroom with crystals, plants, candles and books written by incredible women. 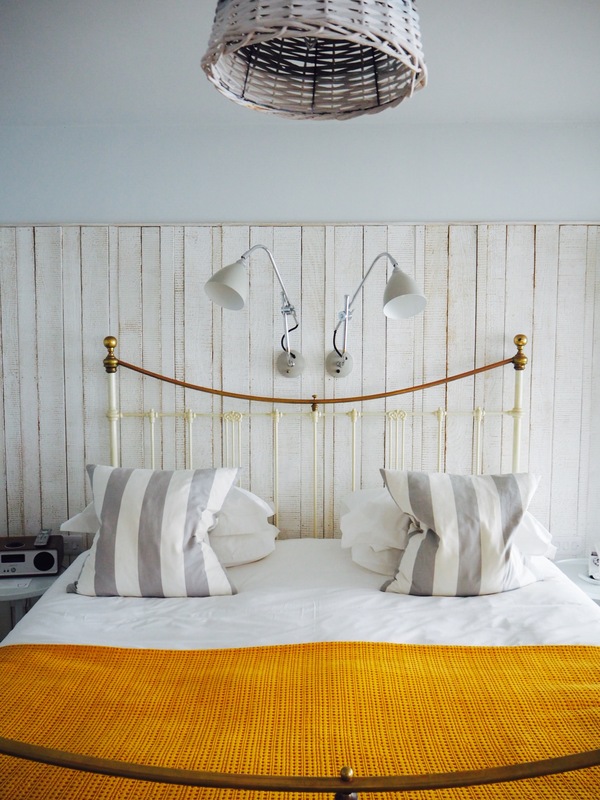 As winter inevitably drew nearer, bringing gushes of rain and grey clouds over my East London home, I was determined to surround myself with light, even on the days when I didn’t quite feel like letting it in. What is the kindest thing that I can do for myself today? It so happened that one particularly grey and uninspiring morning, I woke up feeling like a trip to the seaside may do just the trick. Strolling by the beach to the sound of the waves may be just the cliche, soul-cleansing thing I needed, I thought. 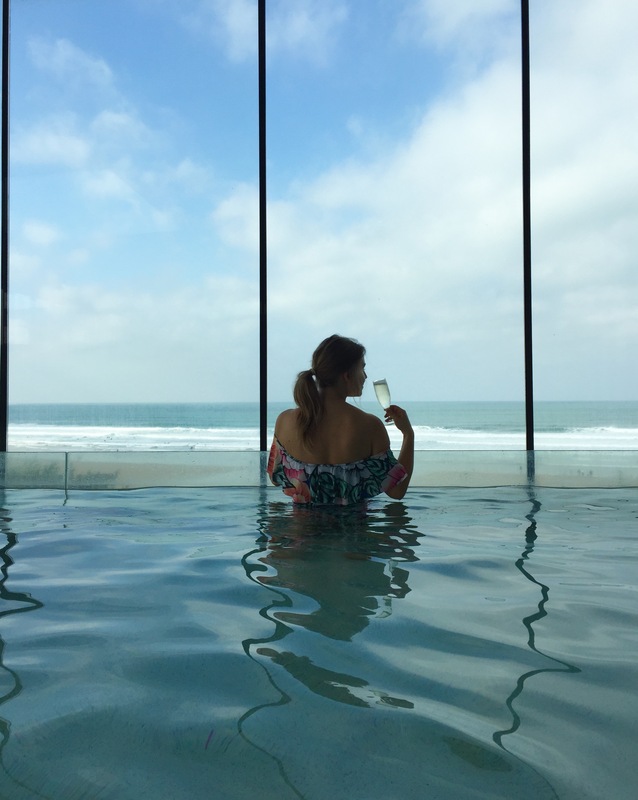 Luck had it that later that day an email landed in my inbox, inviting me on a mid-week break at Watergate Bay Hotel in Cornwall, a destination I’ve been long wanting to tick off my travel list. A quick browse through the website, painting comforting images of coastal walks with ocean views stretching for miles, and I was on a morning flight to Newquay a couple of weeks later. Newquay welcomed me with the smell of salt and a distant wailing of seagulls. 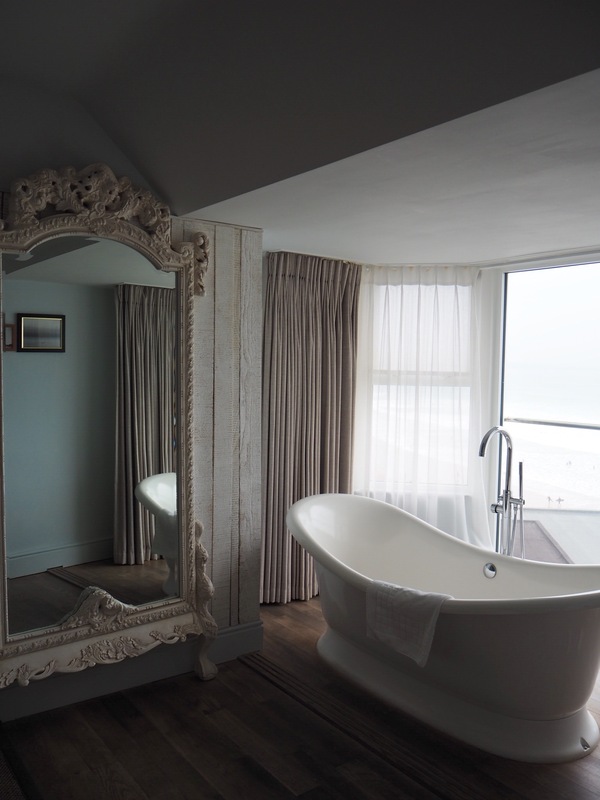 A quick taxi ride, the driver’s Cornish accent cutting through the sea air, and I arrived at the Watergate Bay Hotel. Comfortably snuggled between the rugged cliffs and the Atlantic ocean, the hotel stroke a perfect balance between modern an soulful. Treading sand on the lobby’s floor carried the memories of wind-blown coastal walks. The welcoming, bright interiors, complemented by wall-length windows facing the beach like a gorgeously painted, moving picture had an instantly soothing effect. As I’ve discovered, the hotel’s modern space wasn’t short of cosy corners, conveniently filled with comfortable blankets, peppermint tea at hand and a bunch of travel magazines, perfect for those cosy evenings in when time passes slowly, measured out by the sound of the waves. There was also a Swim Club with huge windows overlooking the ocean, and a hot tub right outside. My room was a dream, the nautical theme a perfect match for the views outside. These, as it later turned out, were even more enjoyable when admired from the comfort of a wonderfully indulgent bubble bath, my little moment of indulgence interrupted only by a distant sound of seagulls. As you may imagine by now, my stay was nothing short of dreamy. Swiftly after dropping off our bags my friend and I headed to the pool, a glass of prosecco in hand as it only seemed appropriate to indulge. 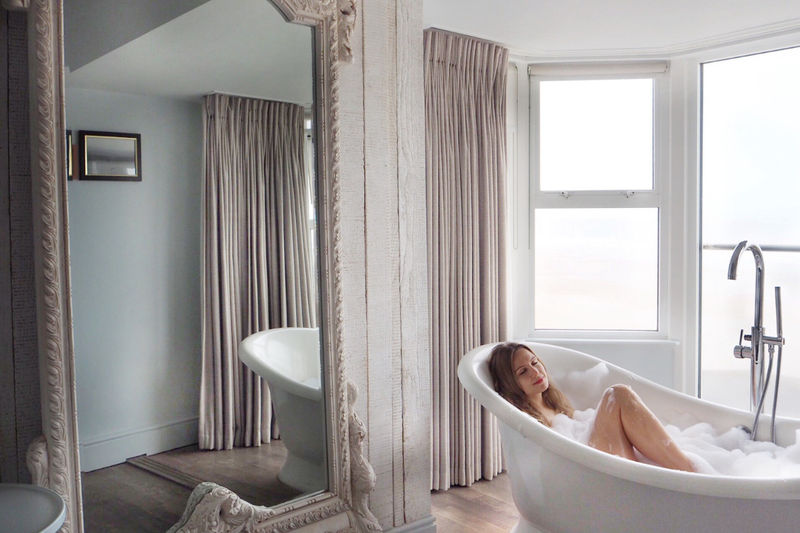 The Scandinavian-style jacuzzi outside turned out to be just the spot to admire the views. It was particularly wonderful in the aftermath of the storm Ophelia, as the sky took on dusty yellow hues and the rough waves joined in the spectacle just as the sun was about to set. 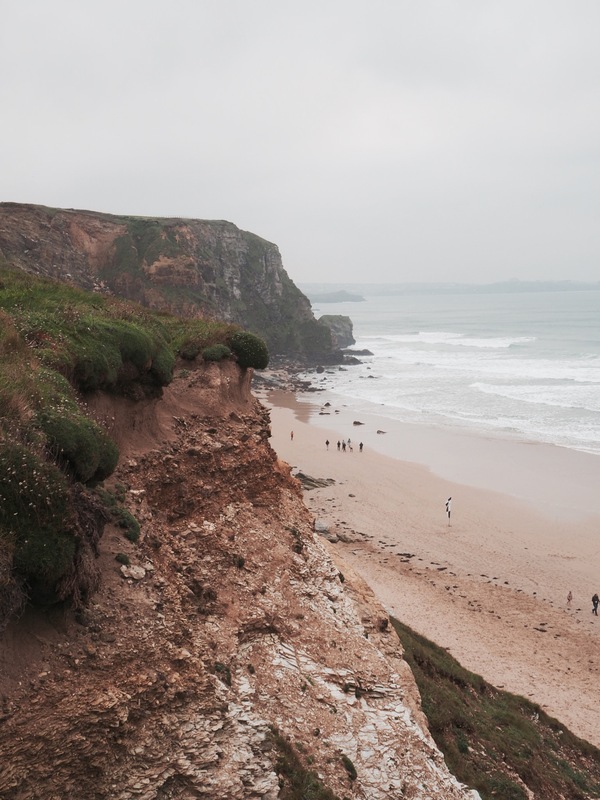 The Watergate Bay isn’t just about the views. 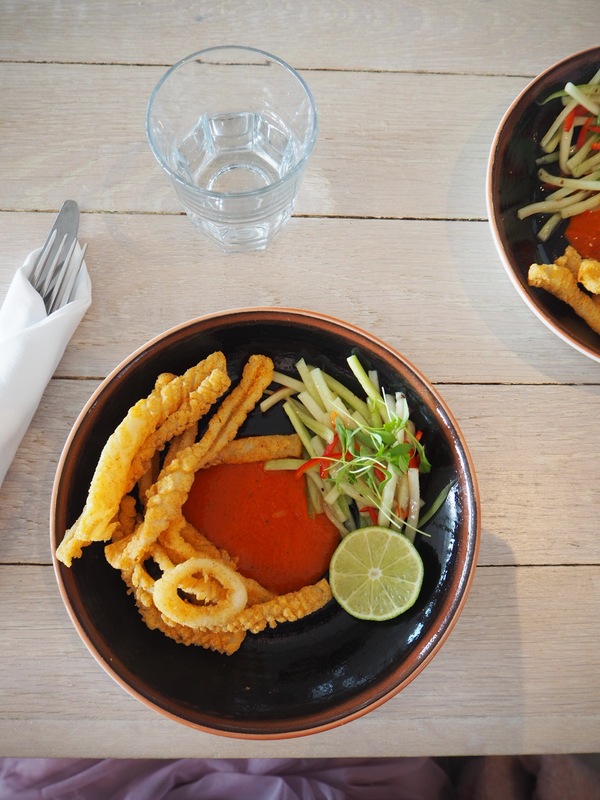 As a self-proclaimed foodie, I was happy to find out that the hotel places just as much emphasis on the local cuisine as it does on the aesthetics, one complimenting another. 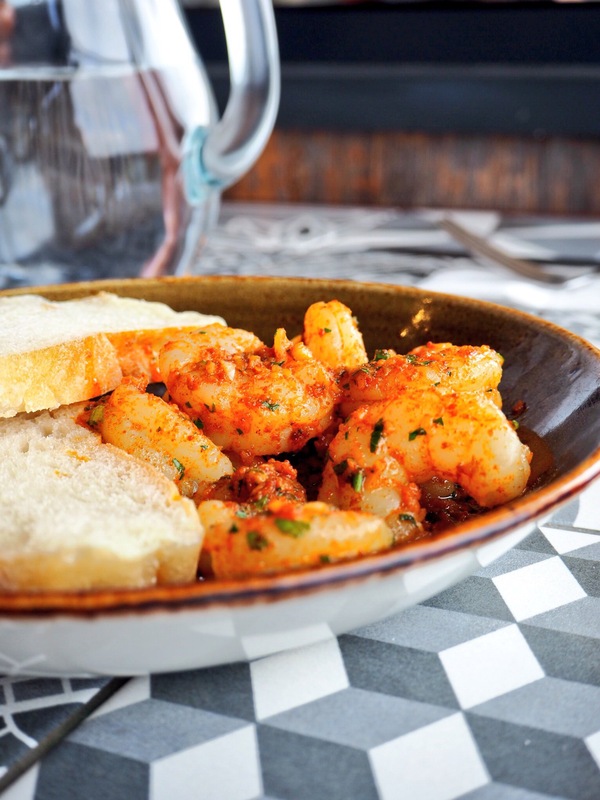 Filling your lungs up with crisp, coastal air is soothing for the soul but it’s the hearty, seaside meals that add a much-needed feeling of comfort, almost like a warm blanket on a rainy day. 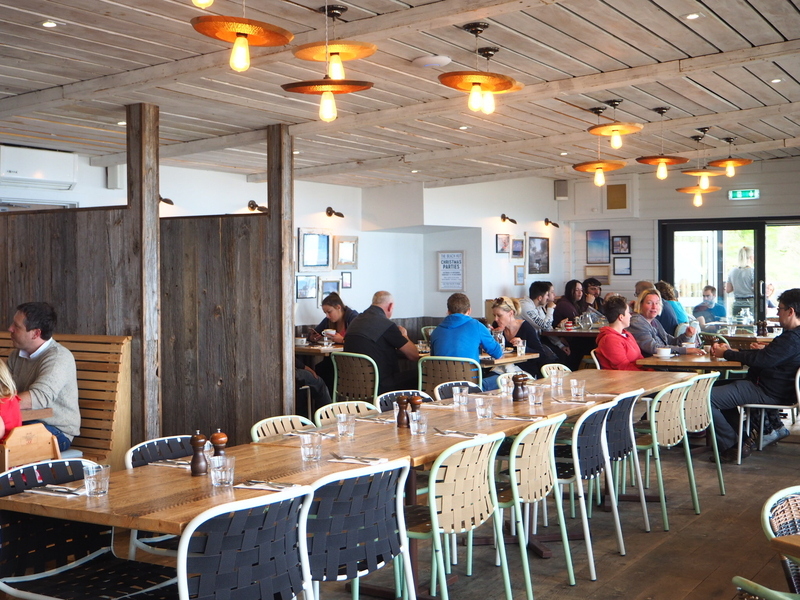 Undoubtedly, Watergate Bay Hotel’s love for local food was the reason why they’ve partnered with Jamie Oliver’s Fifteen Cornwall as a part of their four-day break offer. 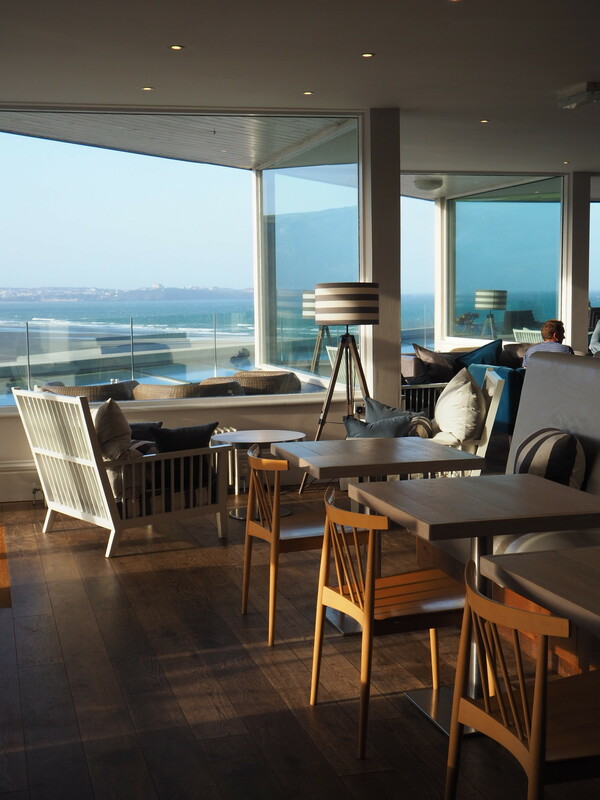 The deal gives foodies like myself a rather delightful opportunity to dine at Cornwall’s top restaurants – the hotel’s brassier Zacry’s, the recently refurbished Beach Hut and Fifteen Cornwall. Coastal walks definitely worked up our appetites. 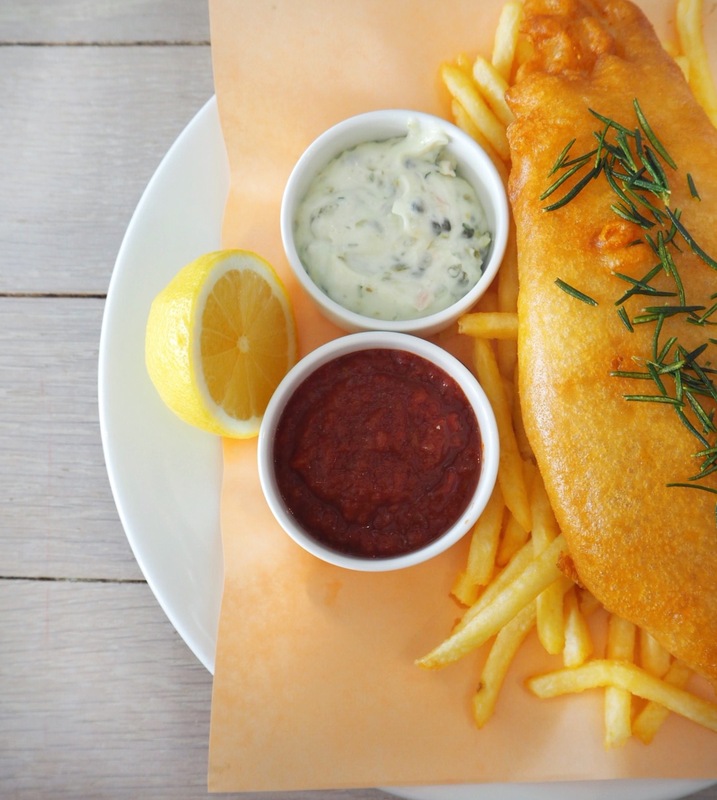 As my friend and I would return to the hotel, rosy cheeks and wind-blown hair, nothing could quite beat a hearty portion of fish and chips at the hotel’s Living Space or equally delicious clams at the Beach Hut. 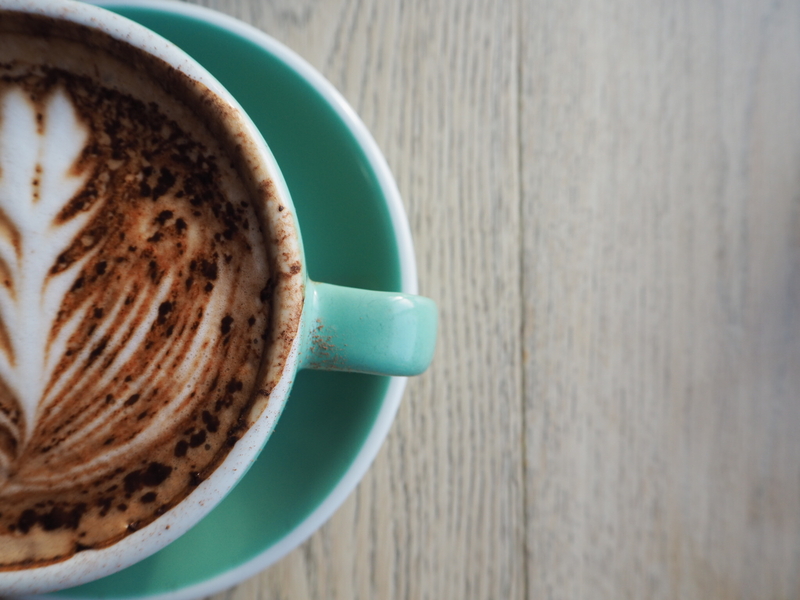 Dining at Fifteen Cornwall, a social enterprise helping young people break personal barriers, sweetened the, already deliciously good, deal. Their new five-course tasting menu extravaganza, created by the newly appointed head chef Adam Banks, added an extra flavour to our final night. We popped in there for a coffee. Such a beautiful setting.